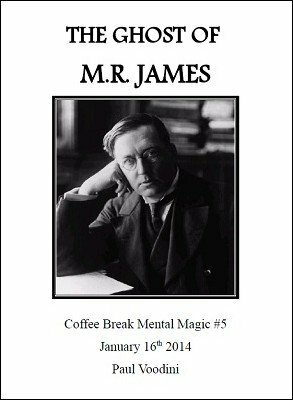 This is the fifth edition of the Coffee Break Mental Magic series and features a spooky routine based around the ghost stories of author M.R. James! When a collector of occult and esoteric books visits a small bookshop in the English village of Castleton, he could not have predicted that a demon would later be sent to kill him! However as a student of the occult, the book-loving collector is not as easy to kill as might be expected! This is an enthralling story-telling routine that utilises a thumb tip bill switch or classic billet switch (or even a change bag). It is beyond the scope of a Coffee Break Mental Magic release to actually teach how to effect a bill switch or a billet switch. By purchasing this release you acknowledge that you already have these skills or have the ability to locate the required knowledge. It is recommended that a thumb tip is used for this routine, although it is not essential. This is the perfect routine to spook your friends with on a dark winter's evening, with a chill wind rattling the glass in the window pane! Gather closer and let us swap ghost stories! What you are getting here is a story - I did not feel The effect was that strong - it would be easy to substitute Something else. Still for the price this is a good addition. So far I have all the manuscripts in this series except the Sherlock Holmes edition. I have enjoyed each one.